This just in! 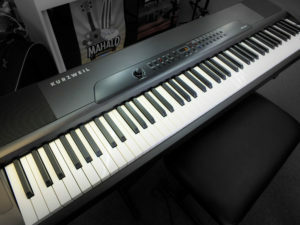 An awesome new model from Kurzweil, an affordable digital piano with over 200 awesome sounds, including an amazing array of Wurlitzers and Rhodes sounds, as well as great piano and synth sounds. This piano would be fantastic for music production. Midi ins and outs, USB, stereo ins and outs, 2 track recording function, beats and rhythms, layering, and italian grand graded hammer action. RRP $1595. Come and try it out! This entry was posted in Advice, Keyboard/Piano, Shop. Bookmark the permalink.